If you are looking for colorful winter flowers in your garden, look no further than the Hellebore. With many different species to choose from, Hellebores are a fantastic addition to your winter garden. Ideal for woodland or cottage gardens, these tough, resilient plants will liven up gardens year-round. They bloom in the winter with gorgeous, colorful flowers in hues of pink, white, green, yellow, purple, and red. Learn how to best care for your winter Hellebores with our quick maintenance tips to keep them healthy season after season. In our DIY Garden Minute Ep. 52 - "Hellebore Care: Quick Care Tips For These Winter Bloomers," we'll explain some basic maintenance to perform on these winter-blooming plants that bring us color year after year. This episode is meant for any level of gardener who wants to learn how to best care for their Hellebores. Obviously, one example of a winter-blooming plant is the Hellebore. Today's topic is "Hellebore Care: Quick Tips"
Click the graphic above to save "Hellebore Care: Quick Care Tips for These Winter Bloomers" to Pinterest for later! Learn important tips about caring for your winter-blooming Hellebores, including water needs and pruning tips. 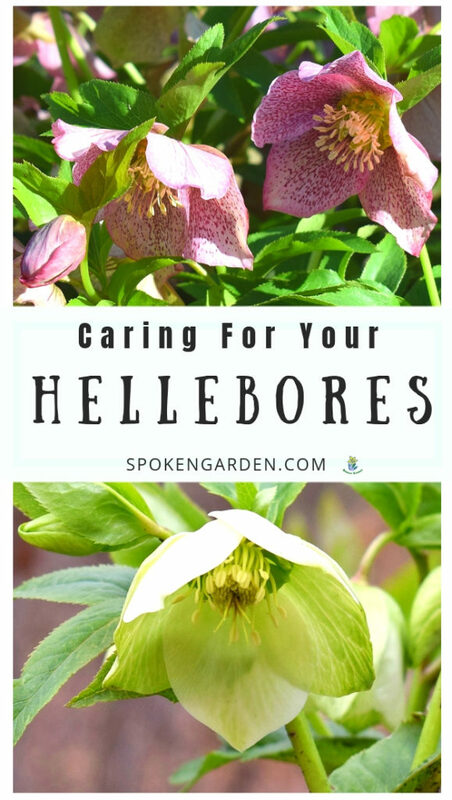 Quick care tips for your Hellebores this winter. General Hellebore watering, fertilizing, and other needs.